Today marks the 6th birthday of My Life, I Guess…! Over the last 6 years, a lot has changed in my life. Personally, professionally, and online. In some ways, it feels like this blog has always been a part of my life. Yet at the same time, I can’t believe that it’s already been 6 years. I have been blogging in one form or another since we first got the internet back in the late 1990s. Over the years I’ve used numerous platforms like Angelfire, Geocities, MySpace, LiveJournal, and Blogger to host my various blogs. I even bought my first domain back in 2002. This was before things like WordPress and Facebook even existed. Which meant that I spent more time on the back-end stuff (like all doing all the coding, designing and maintenance by hand) then I did creating content. Not that the content I created was great. It was a lot more like a public journal than anything. And in hindsight, I probably shouldn’t have been publishing things like my class schedule online for the whole world to see. Back in 2011, I tried the free version of WordPress for the first time. Again, the blog I ran at the time was more like a public journal. But after discovering the world of Personal Finance bloggers, it started to morph into more. It wasn’t just a handful of people that know me in real life reading my blog anymore. Strangers were reading it. And commenting on it. And promoting it, too. So I rebranded (if you can call it that), I purchased a domain, and on April 16, 2013, My Life, I Guess… debuted. Little did I know how significant that that date would become. Or how big of a role this little website of mine would play in my life. 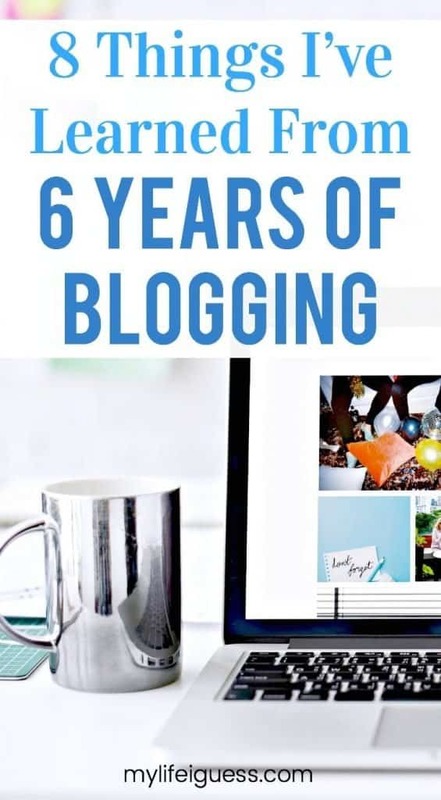 To mark the occasion, I want to share with you 8 things I’ve learned from the last 6 years of blogging. Not only will you learn a lot when you’re researching the topics that you write about, but running a website will teach you a lot, too. From launching a website, maintaining the technical side, creating engaging content, and running successful marketing and social media, there is a lot to learn. Especially in the online world where things are constantly changing. Nowadays, there is so much information about blogging (especially blogging for money) out there, that it can be overwhelming. And sometimes confusing. Is your headline optimized? Did you use the right keywords? Have you included your affiliate links? Is your meta description the right length? Did you include a call to action? Is there at least one pin-able image in the post? You can sign-up to hundreds of newsletters and free courses and spend all your time learning about these things. But thanks to algorithm changes, everything you know about how to be successful on Pinterest today, for example, is different than it was a year ago. And might be completely different again tomorrow. Of course, it’s up to you to decide what you’d like to learn more about, and how much time you spend on it. If you blog about blogging, then please ignore this point. But for most of us, other bloggers probably aren’t your target market. Don’t get me wrong – other bloggers will absolutely support you. They will read your blog. They will comment and share and engage with you. I mean, we’re bloggers! We like to read about blogging and we like to read what other people in our niche(s) have to say. So naturally, we will read each other’s work. Other bloggers are your peers. Maybe even your mentors. But they probably aren’t your “target market”. For example, other personal finance bloggers probably don’t need to know how to tracks their bills. But my target market, the people that I’m trying to reach with my blog, probably do. Yes!!! 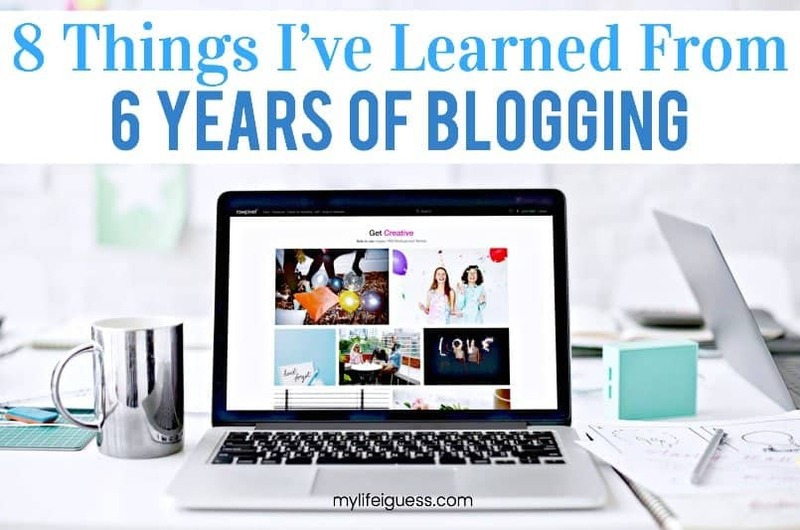 I spent my first few years blogging “for other bloggers” instead of for people who were going through the same struggles as me. I have honestly met some of the most amazing people through my blog. Even though I’ve only met one other blogger in real life (Hi, B! ), and that was only because she just so happened to move to the same community as me. Over the years, I have leaned and relied on so many people that I’ve never met in real life. 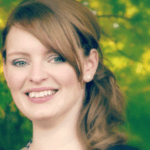 They’ve helped me with my own finance related questions, blogging questions, and have given me a lot of personal support when things were going rough. I’ll never forget the first “fan letter” I received (and not just because her name was Amanda, too). Or the many, many people that have reached out to me over the years. The response I got to my post about taking a stress leave, in particular, has blown me away. But I’ll also never forget the first hate comment, either. That way we don’t have to read your oh poor me rubbish all the time"
However, majority of the people that are reading your blog will never reach out or interact with you in any way. They will lurk. They will read. Then they’ll move on. And the only way you know they were there is from the number of pageview in your stats. Something that I don’t see mentioned that often is how much time bloggers spend doing things other than writing. Yes, bloggers talk about how much marketing they do, but there is still even more work behind that. Changes made by others companies can impact how you blog, or how your blog appears in search engines. Google changes their algorithms a few times a year, for example. And some of these changes are big. But even small changes can have an impact. Things like when Twitter changed from 140 characters to 280 characters. When Yoast changed the meta description length. Or when Google + shut down. How much of this “extra” stuff you do is entirely up to you. But sometimes, there are things that you can’t ignore. These were things that I personally didn’t change, but I couldn’t ignore. And that took up a lot of my time that I could have spent writing instead. But I’ve seen even more people just give up entirely. Sometimes it’s because things in their lives change, which takes priority over blogging. Sometimes it’s because their blog has served its purpose. Or they simply aren’t interested in blogging anymore. Other times it’s because they believed the “how to make $5,000 a month off your brand new blog” hype, and gave up when they realized that even making $5,000 a year is a real challenge. I’ve never made more than $3,000 a year. Even my best month topped out at $875. Although I didn’t start blogging to make money from it, it’s hard not to use income as a measure of success. I also keep monthly blog stats. I try really hard no to make a habit of looking too closely at these stats though, because, to be honest, it can be rather depressing at times, too. Like when I realized that my pageviews for 2018 were only slightly higher than they were as a new blog back in 2014. And how my pageviews have gone down by more than 50% since 2016. Especially because in 2016, I only posted 10 articles. (Yes, the year that my site had the best “stats” was also the year that I posted the least.) Or how 2 months ago (February 2019) was my worst performing month yet. I think you can guess what sort of feeling that left with me. But take a look at that graph. It shows my monthly pageviews starting from August 2013 (when I learned how to install Google Analytics) to March 2019. The first thing you probably notice is those 6 months where my stats sky-rocket (mostly thanks to seasonal content that I rank really well for). But the first thing that I, the pessimist, notice is how the trendline (in pink) is going down, instead of up. The truth is, my numbers are all over the place. (Which to be honest, isn’t that surprising because my posting schedule has been all over the place, too.) I imagine other bloggers experience these highs and lows, too. And those lows can really make you think about giving it all up. There is money to be made online, and starting a blog is a good way to get a piece of that. But you can be a successful blogger without making a penny. It really depends on what success looks like to you. When I first started blogging, I gauged how “successful” a blog post was by the number of comments it received. Nowadays, commenting has really declined, and there’s more emphasis on social media shares and overall pageviews. Sure it was exciting the first time I reached the $100 payout for Google Adsense. But reaching that point didn’t feel like a success to me. I feel successful when someone, one of those aforementioned lurkers (or fellow bloggers), reaches out and says that my post helped them in some way. Between the highs and the lows, the good and the bad, the struggles and accomplishments, the most important thing I’ve learned about blogging is that I have a lot to be proud of. Things like how far I’ve come in 6 years years – online and offline. All the amazing people that I’ve met. How nearly half a million people have taken even just a little bit of their time to read what I had to say. How I know that I’ve made a difference to someone. I cannot wait to see what the next 6 years of blogging will bring. CONGRATULATIONS!!! 6 years is super impressive. But now for the real question: what’s a blogging carnival? :) Excited to read your stuff for years to come! Blog carnivals used to be big before Google decided they didn’t like them. They were a lot like round-up posts, but bloggers would submit their own posts to be included, and you could also sign up to “host” them. Haha, I remember blogging carnivals. They were the thing for quite a while, but man they were a pain. (I volunteered to do a few.) I’m actually pretty glad they’re no longer popular because trying to check and see where I should apply every week was tiring! Sorry to hear that pageviews are down. My blog has sort of plateaued which is disheartening, but it also means I’m more committed to being online (now that I actually have the time for it — amazing how much time/energy being single frees up) and engaging more. As for SEO, I’ve never really done enough with that. It just seems ever-shifting and overwhelming and… Yeah. I’ll just write what I write and hope for the best because any advice I read could easily be outdated in a month or two. Oh yes – I remember hosting a carnival or two. But I was really late to that game! I know part of my declining pageviews was due to technical issues, but it still is disheartening, for sure. The good news is that it seems to be recovering. And yes – I blogged SO MUCH more when I was single than I do now. I am also guilty of not engaging as much as I used to either. I try to keep with basic SEO stuff, but as you said – as soon I get the hang of it, something else changes. It never ends! PS. What is UP with comments declining? I love engagement with my readers so it’s driving me batty!